From girls’ education to saving the elephants, we’ve got your causes covered. You survived Black Friday and Cyber Monday. Now it’s time for Giving Tuesday. Not familiar? Giving Tuesday started five years ago as a collaboration between the United Nations Foundation and 92nd Street Y to shift from the glutinous nature of the shopping holidays just after Thanksgiving. The day was picked to mark the start of the charitable season going into the holidays and acts as a reminder of the generous spirit of people around the world. Last year, 700,000 people from over 70 countries gave $116 million on Giving Tuesday. There are so many causes it can be hard to choose where to commit your time and donations. Fortunately, we put together a list of 21 non-profits covering every cause Global Citizens are passionate about for #GivingTuesday. This organization tackles the root challenges of hunger by empowering women to feed themselves and their communities. The Hunger Project works across 22 countries where they take a holistic approach to sustainably end hunger. Instead of simply donating food, they invest in men and women at the local level, providing the resources for them to start their own food-growing projects. To learn more, donate, or check out how to volunteer go here. Share the Meal is an app that embodies the idea of being globally-minded while connecting with people who need food assistance. And because it’s all on your phone, it’s super easy. How it works: download the Share The Meal app from United Nations World Food Programme (WFP.) Donate $0.50 to feed a child for a day or $3.50 to provide meal assistance for a child for a week. The money goes to WFP’s food assistance programs which are already well established around the world in conflict regions like Syria, drought-stricken places like Malawi, and 78 more countries. By using the collective power of micro-donations, Share The Meal has provided over 9.3 million nourishing meals. Giving Tuesday doesn’t necessarily have to be about financial donations. There are many ways to donate including your time. More than 90% of soup kitchens in the US rely on volunteers. So gather your family and friends and give back to those in your own community today. You might just find a unique spot to volunteer like this Sandwich Project in Minneapolis, where teams of six people gather to make 150 sandwiches for the homeless in 30 minutes, or an organic soup kitchen to support while researching local kitchens nearby. Read More: Can You Guess Which Country Is the Best at Giving Back? Polio has been reduced by 99.9% since 1988. The world stands on the brink of eradication in the next few years, with the chance to make polio only the second ever human disease to be eradicated. The Global Polio Eradication Initiative (GPEI), the international partnership that coordinates eradication efforts, needs more than $1 billion a year to help achieve this goal. Ahead of World AIDS Day next week, Johnson & Johnson is matching all pledges on its CaringCrowd website dollar for dollar up to $250 per person per project until the $100,000 cap is reached. The site allows you to choose which global health projects you’d like to fund, including getting food and nutrition to HIV positive kids, helping girls stay in school in Kenya, and battling cholera in Haiti. In places of conflict and crises, the symbol of the International Red Cross is a trusted site for those in need. It has operated for more than 150 years, and works in 80 countries, along with Red Cross and Red Crescent societies around the world. The red cross and red crescent were seen this year in Haiti, in the aftermath of the deadly Hurricane Matthew, and on the battlefields of Syria, where the Red Crescent society helps civilians injured by bombing. Nakuru Children's Project is a small NGO determined to improve education for children in Nakuru, Kenya. The project is led by local teachers who identify the needs of poorest and most vulnerable kids in their community — then work tirelessly to address them. This includes paying the school fees for children who would otherwise drop out after primary school, and are at risk of child marriage, substance abuse or falling into dangerous child labour. The best part? No-one involved in managing its projects takes any kind of wage, so 100% of public donations go to helping the 1,500+ children it supports. Why Nakuru Children’s Project? Right now, funds are extremely tight after the fall in the value of the British pound following the EU referendum and the organization is being forced to turn away desperately deserving kids — including smart girls like Ann, who dreams of being a doctor. Sign up to sponsor a student here. 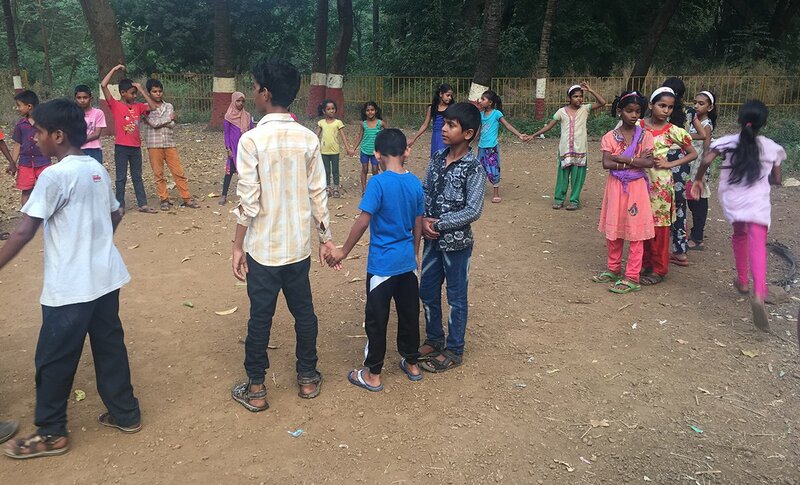 Children in Mumbai's Magic Bus program play after school. Started by a Brit who was relocated to India for work, Magic Bus is a Mumbai-based program that gives children who are living in poverty a chance at a childhood. Youth leaders from the community conduct play sessions after school. Children who live harsh conditions run, play games, and generally get to act silly. And the youth leaders are given training and skills by the program to enter the professional world. The one requirement is that children must be attending school to also be a part of Magic Bus. If a student stops going to classes, youth leaders will reach out to their teachers and parents. It costs $25 a year to support a Magic Bus child. Donate here. The Center for Arts Education is a non-profit dedicated to providing a well-rounded education in the visual and performing arts for New York City public school students. Several studies have shown that arts education can have positive educational and social outcomes for students from lower socio-economic backgrounds, as well as students with behavioral issues. This organization provides after-school care for students, teacher training workshops, and parent engagement. You can donate here. College Possible matches disadvantaged students with education coaches in the hope to reduce the “achievement gap,” in which low-income and students of color are falling behind their richer and whiter counterparts at an astonishing rate. The goal is to ensure that these students get to college, and stay in school once they’re there. 98% of College Possible students are admitted to college, and students who participate in the program are four times more likely to graduate college than their peers, according to the organization’s website. You can donate here, or serve as an education coach for one year through Americorps or Vista. World Bicycle Relief provides sturdy, high-quality bicycles in 18 developing countries around the world. The educational impact of bicycles is especially remarkable in rural communities where schools are few and far between — increased mobility leads to higher academic performance and student attendance. The organization has delivered over 100,000 bicycles to students around the world since 2009. You can donate here, and every donation will be matched. Pencils of Promise plays a crucial role for communities that lack proper access to educational facilities: by building schools and training teachers. Along with building nearly 400 schools in Ghana, Guatemala, and Laos since 2009, the organization provides teacher training, and water and sanitation (WASH) assistance. According to its site, the organization breaks ground on a new school every five days, providing students the education they need to escape extreme poverty. You can make a donation or support a student. Since 1993, Schools on Wheels has provided educational services for homeless students living in the Los Angeles area. More than 1.3 million US students experienced homelessness in 2013-2014, according to the National Center for Homeless Education, making it far harder for them to graduate from high school. The organization provides tutoring, school supplies, and most recently built a Digital Learning Center in Los Angeles’ Skid Row community. If you’re in the Los Angeles area, you can volunteer. Otherwise, a donation will still go a long way. Water.org was a finalist for the Waislitz’s Award for the 2015 Global Citizen Festival. Their innovation approach to solving water challenges gives some of the 663 million people without clean water by extending micro loans to families to be able to install toilets and taps for clean water. One more reason to donate: they got Matt Damon to talk about toilets. Go here to donate. Three Avocados has little do with avocados. It’s an ethical coffee company which donates 100% of profits to fund clean water projects in Uganda. The generous giving spirit that sparked Three Avocados began when the founder Joe Koenig took a trip to Bulopa, Uganda. Rushing, he and his traveling companions arrived hours late to find that whole village waiting to give them a warm welcome. One villager placed her only possessions, three avocados, into a basket as a welcome gift. This act of kindness inspired Koenig to create a non-profit coffee company that returns the favor — giving everything back. Order coffee and donate clean water here. Nearly 800 million people around the world are illiterate. Two-thirds of them are women and girls. Room to Read focuses on improving literacy and gender equality in education and supports girls to complete secondary school. The group provides libraries full of children’s books and teaching materials in the local language to community schools, and works with the teachers, parents, and community leaders. They also advocate for policy changes. United Nations Foundation’s adolescent girl campaign, Girl Up, engages girls to take action. Since its launch in 2010, the campaign has funded UN programs that promote the health, safety, education, and leadership of girls in developing countries. Youth leaders representing more than 1,400 Girl Up Clubs in 85 countries that encourage local girls to stand up, speak up, and rise up. Around the world, 1,500 people report acid attacks each year. Many more go unreported. The vast majority of victims are women and they are targeted primarily for acting in defiance of a man's wishes — by pursuing an education, entering a career, rejecting a suitor, or any number of other actions that should be regarded as basic human rights. 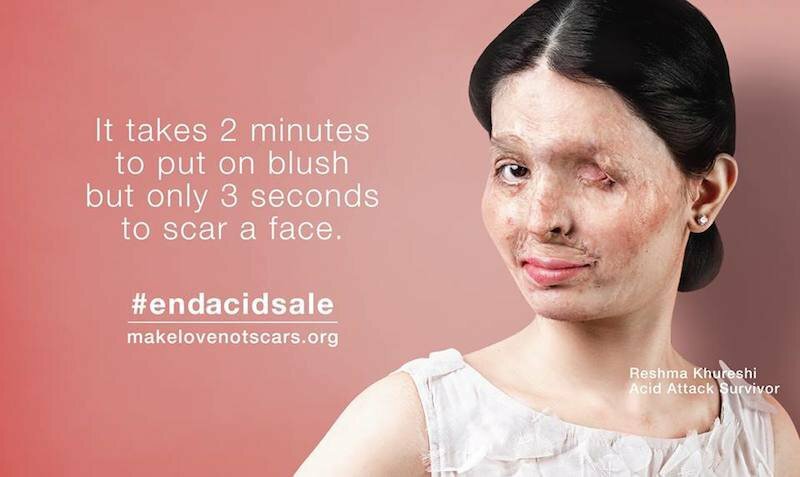 Make Love Not Scars helps acid attack victims with recovery, rehabilitation, and reintegration. They recently launched a platform to help the women (and some men) get hired. Finding employment is often difficult after experiencing such an attack. Founded by trailblazing climate advocate, Bill McKibben, 350.org is one of the fiercest grassroots organizations fighting against climate change. 350.org is active in more than 188 countries and powered by ordinary people who want a fair, sustainble future. They were pivotal in the fight against the Keystone pipeline, and now they’re on the frontlines of the Dakota Access Pipeline. In case you want to give to all the good environmental nonprofits out there but don’t know which one to choose, then give to One Percent for the Planet, a nonprofit that contributes to thousands of environmental groups. They’ve done the heavy lifting of vetting groups to make sure they’re delivering on worthwhile commitments, so all you have to do is join the cause. Even better: you can download their app, connect it to a debit or credit card and all your purchases will be rounded up to the closest dollar for donation. “Protecting Nature’s Protectors” is Thin Green Line Foundation’s guiding ethos and it’s a testament to their deep familiarity with poaching and wildlife conservation. The men and women protecting some of the most vulnerable wildlife populations in the world are often forgotten about. They often lack proper equipment, training, and protection. They are routinely underpaid and are unable to access food and water. Without their bravery, fragile ecosystems would be overrun and destroyed. Thin Green Line Foundation supports their vital efforts with funding and various kinds of assistance. The oceans are under attack around the world from climate change, pollution, overfishing, and much more. Unless changes are made, the world’s oceans could become cesspools of decay. That’s where Oceana comes in: Since 2000, the organization has achieved more than 100 victories to protect more than 1 million square miles of ocean. Oceana has a holistic and symbiotic view of the oceans, understanding that when all of the world’s oceans are healthy, humanity will be healthy.